As we know, that many countries in the world has a lot of natural appearances. One of the familiar natural appearances is the volcano. For example, Indonesia, has more than 100 active volcanoes which spread all over the country, one the most in any other countries in the world. Each Volcano has different heights and charateristics. 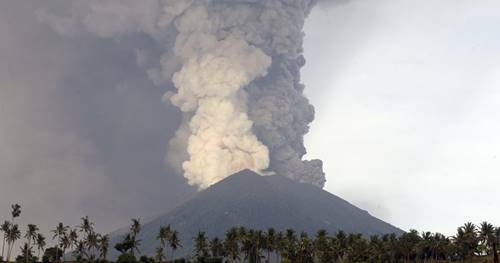 Volcano eruption is natural phenomenon that often happen. There are several effects of volcano eruptions, whether negative effects or the positive ones. What is volcano? A volcano is a rupture in the crust of a planetary – mass object, such as Earth, that allows hot lava. Volcano ash and gases to escape from a magma chamber below the surface. Therefore on Earth, volcanoes are generally found where tectonic plates are diverging or converging and most of them found underwater. A volcano eruption is the escaping of molten rock through a rupture in a mountain on the Earths’s surface. Cloud of ash and lava are coming out of a Volcanic eruption. Erupting volcanoes can pose many hazards, not only in the immediate vicinity of the eruption. Volcano eruptions make several negative effects and also positive effect. The first effect of volcano eruption makes many animals, plants, and humans die. As we know, when an erupted volcano erupts a lot of chemicals and hot dust which is very dangerous. Therefore, because hot dust many plants die. In addition, before the eruption occurs many animals have instinct and towards the settlement of citizens. This is certainly very disturbing the citizens. Then, as a result of due eruptions, many people exposed respiratory diseases. This disease is a sufficiently dreaded impact of many people, therefore they are advised to wear masks at all times. There are many reported volcano case around the world that take couple dead victim. Next effect is most of residents house were destroyed. Hot dust are ejected to cover the roof of the house. This is what causes residents to evacuate in safer places such as mosques or other large buildings. Besides they must to leave home, they also lost a lot of things and possessions. Consequently, they got considerable material losses, which burdening the victim. In the other side, volcano eruptions also have a positive effect. The eruptions materials released by volcano can be useful. Volcanic ash from volcano contains nutrients that are able to fertilize the soil, namely primary mineral substances in the form of magnesium, iron, aluminum and silica. In addition, volcanic ash from the volcano also contains amelierons that function as a soil conditioner that has the same function as fertilizer. Another positive impact of volcano eruption is that people can get new jobs as sand miners. Because the volcanic material from eruptions in the form of sand can be sold at a high enough price. This certainly can help the economy of citizens who get a loss because of this disaster. Volcano eruptions is a natural apperance that can not be avoided. Eruptions usually remove magma, larva, hot dust and volcanic ash. As the result of the eruptions there are negative impacts and positive impacts. The impact is not only feel by humans and environments, but also plants and animals.